Avaaz - G7: no more Nasrins!! As concerned citizens from around the globe, we urge you to call for the release of Nasrin Sotoudeh in Iran, Loujain al-Hathloul in Saudi Arabia, and all other women’s right activists being imprisoned and abused around the world. We call on you to use your economic and diplomatic leverage to free these brave women and send a message to the world that women cannot be abused with impunity. She’ll get 148 lashes on her body, and spend nearly 4 decades in prison. This is the awful punishment Nasrin Sotoudeh will face for peacefully advocating for women’s rights in Iran. 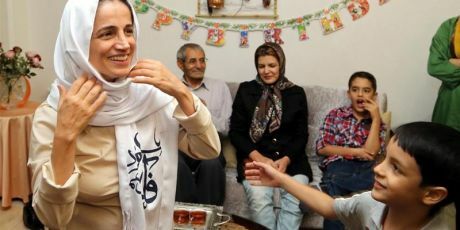 It’s hard to even imagine the pain and suffering this brave woman will face, but our voices can help shine a light on this horror and help free Nasrin and others like her. Nasrin was invited to advise the G7 on legislation to protect women, but was locked up when the meeting took place. If we ramp up pressure now, we can get those rich countries to call for the release of Nasrin --- and others like her -- using their diplomatic and economic leverage to end the global crackdown on women. This could be big -- women's rights abusing governments like Iran and Saudi Arabia are desperate for trade with G7 countries like France and Germany, so their pressure will go a long way. Add your name now ahead of a key meeting -- Avaaz will work with Nasrin’s G7 colleagues to deliver our call directly inside the room!